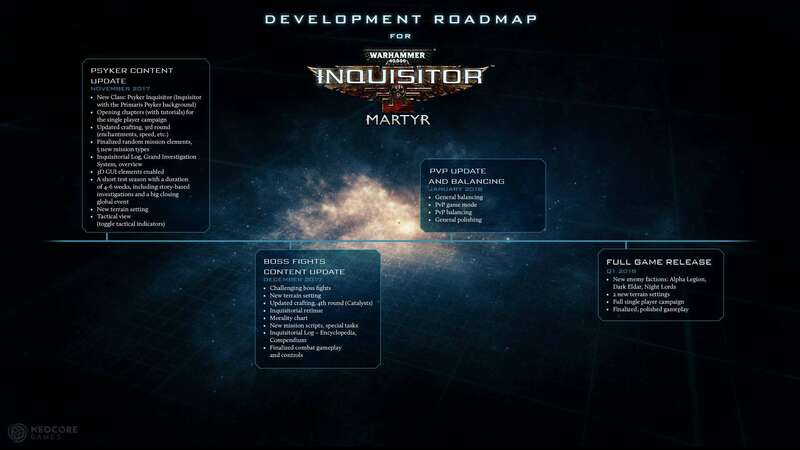 Update: Here is the new Roadmap. Basically nothing much has changed, but what was left out from the October update got moved to November. I dotn exactly get what you mean by "bossfights", because the bosses ive seen so far havent survived for long. I pretty much hope there is going to be a raid mode type of mission, like 4 players needed with a well designed boss fight at the end, taking like 10-15 mins to beat. Im a little bit worried when it comes to the variety of game modes here, because pve has been always the same so far, adding some raids and maybe (my greatest wish) power suits to the game would give this game the badass flavour it needs. Make them availabe to certain mission types or whatever, but as soon as i mention warhammer 40k to my friends, they expect epic power suits (admit it, you want them too). Like with different components and stuff, where you have to craft the different parts too (or loot them or whatever). If youre interested i would love to send some concepts in here ! Its a good game, so keep up the good work! Can You give us new, more realistic roadmap , please ? Most, if not all of the December items are still missing from the game. I think that the last point should be the third one. Will we be able to test the Fortresses mode? Not sure if this was mentioned elsewhere but will there be the ability to customize your characters appearance and gender? At least one more at time of full release. Looks great! Just a question, are there still going to be character wipes before release? Yeah it would be awesome to fight alongside with some grey knight's or an other space marine order as well as i think some cutomization on the armour would be an cool idea. I'am missing Orcs as enemy faction. What are the plans for improving and expanding Coop options/features for online group play? Can you give us some ideas on what the tactical view will be like? This just makes me more and more exited lol i feel like a kid at Christmas again.